The refrigerant from the compressor flows through the condenser and liquid tank, the evaporator and returns to the compressor. 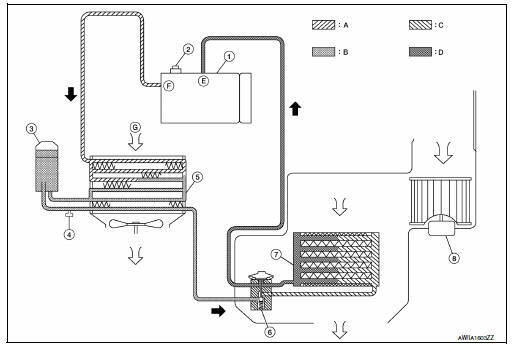 The refrigerant evaporation in the evaporator is controlled by an expansion valve. The refrigerant system is protected against excessively high or low pressures by the refrigerant pressure sensor, located on the liquid tank. If the system pressure rises above or falls below the specifications, the refrigerant pressure sensor detects the pressure inside the refrigerant line and sends the voltage signal to the ECM. The ECM then ceases to supply power to the A/C relay which disengages and stops the compressor when pressure on the high pressure side (as detected by refrigerant pressure sensor) is over approximately 2,746 kPa (28 kg/cm2, 398 psi), or below approximately 120 kPa (1.22 kg/cm2, 17.4 psi). 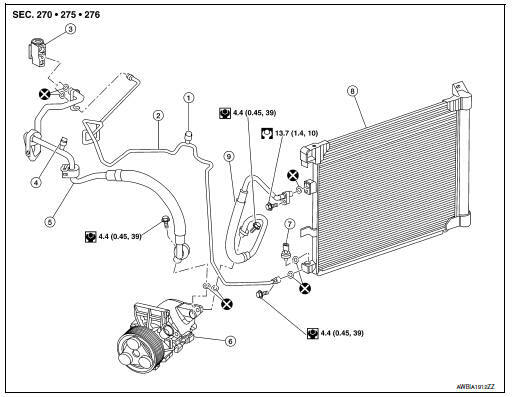 The refrigerant system is also protected by a pressure relief valve, located in the rear head of the compressor. When the pressure of refrigerant in the system increases to an abnormal level [more than 3,727 kPa (38 kg/ cm2, 540 psi)], the release port on the pressure relief valve automatically opens and releases refrigerant into the atmosphere.